Zeal Video Player for Windows 8 can be easily located under ‘Music & Video / Video’ section of Windows Store. Using this lightweight Windows 8 video player, you will be able to play video files in WMV and MP4 formats. It is true that Zeal Video player does not offers support for multimedia files in other formats, then too it will be a nice option for you. It has got an easy-to-use interface that works best on touch machines and on the same time it is easy to operate Zeal Video Player with a mouse. 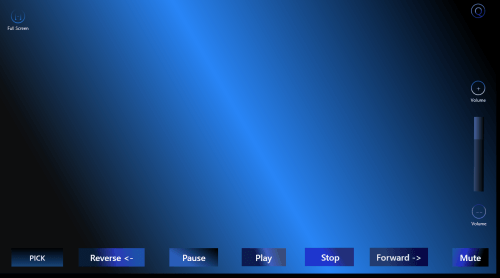 On launching Zeal Video Player For Windows 8, you will be shown following interface as in screenshot below. To play media on your Windows 8 machine. Click on the ’Pick’ button placed on the bottom right section of the interface. On doing so, you will be taken to a new window for selecting one file at a time. Select the file and press the Ok button in the bottom-right section. Next, the player window will load, but will not play. To play the selected video file, you will require pressing the ‘Play’ button placed at the bottom. It won’t be necessary to explain the purpose of ‘Play‘, Pause’ and ‘Stop’ buttons. On clicking on ‘Reverse’ button the pace of playback will get slower and a click on ‘Forward’ button will have opposite impact. 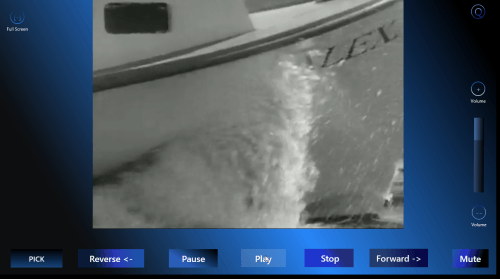 On the right side of the player is a vertical slider control for adjusting the volume. On the top-left section exists the button that can be utilized for watching the video in full screen. Also, check out our posts on Metro Media Player, Radio Apps, and Lyrics Apps. On the webpage you will need to click on ‘View in Windows Store’ button. After being redirected, click on ‘Install’ button and it will hardly take any time to download this 512 Kb app. The main highlight of Zeal Video Player for Windows 8 is its simplicity. The overall impression delivered by this free Windows 8 player app was quite good and I have no issues in recommending it.